While cleaning up the detritus of the holidays—scraps of wrapping paper and packing lists—I discovered this card in the bottom of a J. Crew shipping box. I was immediately struck by the simplicity of the message and wished I’d come up with something half as eloquent for our own holiday greeting to clients. I struggled with trying not to be too somber, too heavy, too flip or too clueless as I contemplated what message to impart. The J. Crew message was perfect. Of course, J. Crew has managed quite a few PR coups over the past few months, thanks to Michelle Obama’s fondness for the retailer for her own and her darling girls’ wardrobe. And the subsequent marketing impact has not been lost on Wall Street or in the mainstream media, as this Time magazine article shows. J. 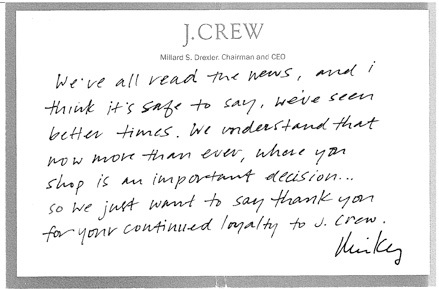 Crew is one of the few bright spots in the tattered retail industry. What is J. Crew doing right? I think they start by understanding their brand and being true to it. With their advertising, their clothing, their colors and indeed, the simple messaging on a throw-away packing slip—it’s all in sync. Simplicity, quality, tradition and reality with a sprinkling of whimsy. There’s even a bit of hope in Sasha’s pink coat and bright orange scarf, and that’s what we’re all looking for. But for me? Right now I really want Michelle’s green gloves!